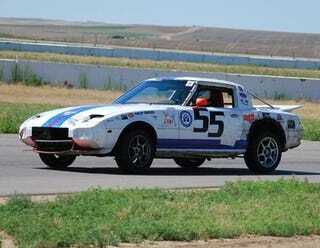 Mazda Steps Up Its 24 Hours of LeMons Dominance: Win Number Eight! What's the winningest marque in 24 Hours of LeMons history? Mazda! With today's win by the Ghetto Motorsports RX-7, Mazda now has eight overall LeMons wins (Toyota and BMW are tied for second, with five wins apiece). We'd seen the Ghetto Motorsports RX-7 in Houston, and the team didn't stand out as much of a threat to run the most laps of the entire field. The car is a genuine pile of crap, not triggering our Cheat Detectors in the slightest, but driver skill and reliability gave the team the win by a comfortable 10 laps today. Congratulations, Ghetto Motorsports! And congratulations, Mazda! When are we going to see your LeMons accomplishments trumpeted in your car ads?